Each year, the top scoring Destination Imagination teams in each affiliate around the world qualify to send teams as representatives to Destination Imagination Global Finals. Often, over 1,400 teams – and about 10,000 students attend the world’s largest celebration and competition of creativity, collaboration and STEAM based problem solving. We are still growing the number of teams at the event. After 19 amazing years in Knoxville, Tennessee, Destination Imagination today announces that the event will move to Kansas City, MO starting in May, 2019. 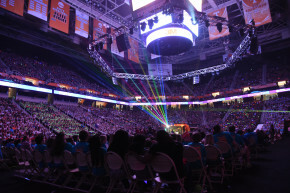 New Hampshire Destination Imagination would like to thank the staff of the University of Tennessee, the City of Knoxville and the State of Tennessee, all of whom have been very gracious hosts for the roughly 600 teams we have sent over the past 19 years. We have made a lot of good friends. In addition, our organization wanted to use this opportunity to explore new ways for teams to showcase their creativity. Our new location will include a much-improved prop room experience where teams will have more space to construct props and the chance to display their creative designs beyond their eight-minute performance times.